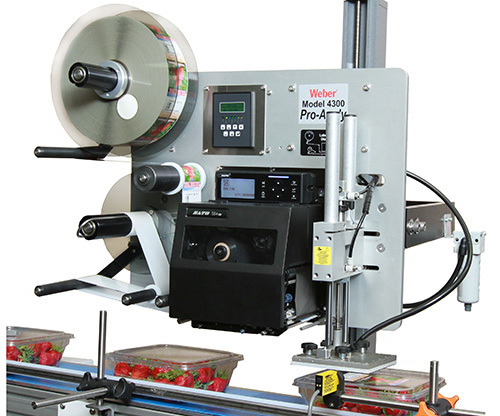 Weber's economical Model 4300 Pro-Apply printer-applicators feature the functionality often limited to higher-duty production systems. 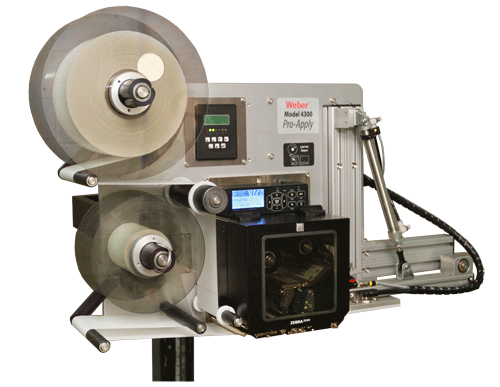 These print-apply systems are built to handle 16 hour days of heavy-duty labeling with a minimum of maintenance. Available with Zebra or Sato print engines in 203, 300 or 600 dpi. •Label placement accuracy to within ±0.03"
The most common method of air-assisted label placement used for standard applications, and is particularly useful in the labeling of recessed areas on products like clamshell lid for food packaging. The 4300 swing-tamp applies labels to the front or back of a product using a 90-degree swing arm applicator and tamp-blow technology.